Which Strategy Should I Use? What you need to remember when using PinoyInvestor is this: different sections in PinoyInvestor serve DIFFERENT purposes which means they are for DIFFERENT types of investors. These sections have different requirements, time horizons, and Investment Strategies as summarized below. Thus, the best strategy is the one that best suits your investment profile and risk tolerance! To learn how you can adopt the Buy & Hold, Cost Averaging, and Market Timing investment strategies, click the link and head over to the PinoyInvestor Academy. Can I Use Fundamental Analysis and Technical Analysis Simultaneously? Absolutely! Although short-term trading (using technical analysis) and long-term investing (using fundamental analysis) are seen by many as polar opposites, many market participants have experienced great success by combining these two strategies! For example, investors who believe in fundamental analysts may also use technical trading techniques to figure out the best time to enter into an undervalued security. Using Fundamental Analysis, you can decide to buy a good, undervalued stock with high potential for profit. And yet by timing entry using technical analysis tools, you can greatly improve the gains on that chosen stock! Meanwhile, some technical traders might also look at fundamentals to add strength to a technical signal. For example, if a sell signal is given through technical patterns and indicators, a technical trader might look to reaffirm his or her decision by looking at some key fundamental data. 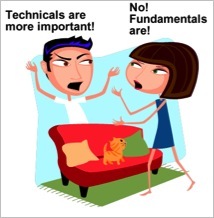 Oftentimes, having both the fundamentals and technicals on your side can provide the best-case scenario for a trade. Use and choose a strategy that works for you! Don’t be left behind! Get FULL ACCESS to all of PinoyInvestor stock reports by upgrading to Premium Access. This investment in knowledge will surely pay the best interest!